Hero banner reading Disability History Week. #disabilityResist. The disability community will not be broken! Image of a cracked glass over a concrete texture. Logo for Instagram and Twitter. Through the history of our disability community, art provides an outlet to express what is often suppressed. Creativity is a driving force in gaining and maintaining our independence, and it’s evident in disability history and culture. From the way we express ourselves, advocate for ourselves and organize for our community, to the way we develop and use assistive technology… The ability to make our own choices gives us the freedom to live the lives we choose. This year, Youth Organizing (YO!) Disabled & Proud celebrates artists and creators with disabilities who have, and are currently cultivating, their own communities. 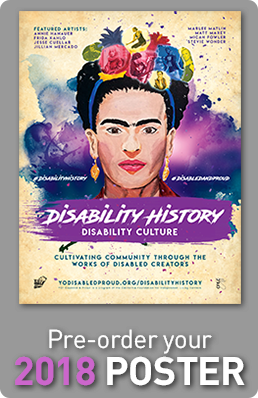 Mexican artist Frida Kahlo is our muse for the 2018 Disability History Week poster. As a woman with multiple disabilities, she expressed herself through surrealistic paintings and has become an internationally-recognized icon. Other featured artists on the poster include: Jesse Cuellar, Micah Fowler, Annie Hanauer, Marlee Matlin, Matt Maxey, Jillian Mercado, and Naomi Ortiz. and get a FREE Disability History Week poster! Is your school participating in Disability History Week this year? and a FREE Disability History Week poster for your classroom! to join call the YO Line! School's Phone: What grade levels will teaching reach? Elementary (K-5) Middle School (6-8) High School (9-12) Community College / University How many classes will be taught? How many students will be reached? 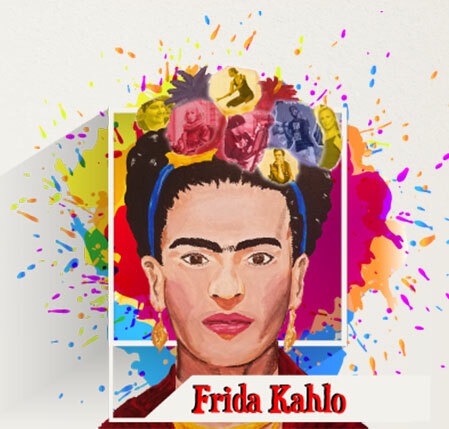 Frida Kahlo Learn more Frida Kahlo was born on the 6th July 1907, though she later changed her birth year to 1910, tying herself to the start of the Mexican Revolution. Born and brought up in Mexico City, over the course of her short life and trailblazing career, Kahlo came to signify many things to many people and has continued to have a huge impact on those who discover her. Jesse Cuellar Learn more Jesse “Sinz” Cuellar is graffiti artist from St. Louis, Missouri, who learned to paint with his mouth after a spinal cord injury left him paralyzed. His accessible artistry led to becoming a spokesperson for assistive technology companies; Jesse has provided demonstrations using his power wheelchair all over the country. Micah Fowler Learn more Micah Fowler is an actor and public figure, currently starring on ABC's new fall comedy, Speechless. Unlike his character, Micah can speak and uses his voice to be a constant advocate for others with disabilities; he is a proud ambassador for the Cerebral Palsy Foundation. Micah recognizes the huge responsibility of representing the disability community and hopes to make them proud. Annie Hanauer Learn more Annie Hanauer is an American dancer, performer and teacher with a disability; she lives between the UK and France. She is a graduate of Fine Arts in Dance University of Minnesota in Minneapolis. As member of Candoco Dance Company, Annie taught and played all over the world and at the opening ceremony of the Olympic Games in Beijing and the closing ceremony of Paralympic Games in London. Marlee Matlin Learn more Marlee Matlin received worldwide critical acclaim for her debut in “Children of a Lesser God,” and also became the youngest and (only deaf recipient to date) of the Best Actress Oscar. She is also a bestselling author and disability advocate. Marlee serves as the national spokeswoman for the largest provider of TV closed captioning, and has spoken on behalf of CC in countries such as Australia, England, France, and Italy. She also serves on the boards of a number of charitable organizations. Matt Maxey Learn more Matthew Maxey, founder of DEAFinitely Dope, hails from Atlanta, GA. As a hard of hearing individual, Maxey seeks to unite the hearing and Deaf community through music and sign language, breaking barriers in the process. His personal journey to find where he fits in best as a hard of hearing individual led to creating an outlet where others experiencing the same struggle to find their identity could find peace, unity, and enjoyment through DEAFinitelyDope. Jillian Mercado Learn more Jillian Mercado is a fashion model represented by IMG/WME Worldwide. As a wheelchair user (due to muscular dystrophy), she is one of the few professional models who has a physical disability in the fashion industry. A prominent figure in the new wave of models challenging beauty ideals in the fashion industry, Mercado is keen to fight the lack of representation of people with disabilities in the fashion industry and their enduring stigma. Jillian is also a graduate of the Fashion Institute of Technology. Naomi Ortiz Learn more Naomi Ortiz is a writer, poet, facilitator and visual artist whose work focuses on self-care for activists, disability justice and living in multiple worlds (intersectionality). She is a highly acclaimed speaker and facilitator, conducting workshops on developing self-care tools and strategies that work in real life. Her book, Sustaining Spirit: Self-Care for Social Justice invites readers to explore the relationships between mind, body, spirit, heart and place. She invites readers to integrate self-care to survive and thrive. Krip Hop Nation Learn more Krip-Hop Nation, founded by Leroy Moore, is on a mission to educate the music, media industries and general public about the talents, history, rights and marketability of Hip-Hop artists and other musicians with disabilities. Sins Invalid Learn more Sins Invalid is a performance project that incubates and celebrates artists with disabilities, centralizing artists of color and queer and gender-variant artists as communities who have been historically marginalized. Axis Dance Learn more Founded in 1987, AXIS is the nation’s most acclaimed ensembles of disabled and non-disabled performers based in Oakland, CA. The heart of AXIS is the commissioning, creation, and performance of contemporary dance that is developed through the collaboration of dancers with and without physical disabilities. Our artistic vision to collaborate with high profile choreographers and cutting edge innovative dance makers of our time was an excellent strategy that has resulted in artistically stunning and significant dance works. More than any other company in the United States, AXIS has been at the forefront of the field, building a bridge between contemporary dance, integrated dance, and disability culture. Chef Christine Ha Learn more Christine Ha is the first-ever blind contestant and season 3 winner of the competitive amateur cooking television show “MasterChef” with Gordon Ramsay. She defeated over 30,000 home cooks across America to secure the coveted MasterChef title, a $250,000 cash prize, and a cookbook deal. Kay Ulanday Barrett Learn more Kay Ulanday Barrett is a poet, performer, and educator, navigating life as a disabled Filipino American transgender queer in the U.S. with struggle, resistance, and laughter. Kay’s bold work continues to excite and challenge audiences. A seasoned speaker, Kay has facilitated workshops, presented keynotes, and contributed to panels with various social justice communities and has been featured on colleges and stages globally. Activists and Advocates from 2000 to 2017 Who are Changing the Disability Community for the Better! Latinx Disability Coalition View Page A coalition created for Disabled Latinx. It brings together diverse perspectives on being part of these two specific communities. It also provides insight and resources in both English and Spanish. DiversAbility View Page An organization that increases the visibility of disabled people. Created and ran by people with disabilities from various backgrounds. It strives to create a space for all disabilities to foster a sense of community with one another. Stacy Milbern on Medicaid Cuts View Page A queer Korean disabled activists shares their experiences on why access to support services is about more than just living in the community. Women Disability Activists Front and Center in Resistance View Page Heather Watkins: in the modern age activism takes on new look. The author of this article explains why new age activism is just as valid as taking to the streets. Black Disabled Woman Syllabus: A Compilation View Page Vilissa Thompson has lovingly compiled a compilation that explores the intersections of being black, disabled, and a woman. While her whole site is definitely worth checking out this is a great place to start. Sample Disability History Week social media content. Order a 2018 Disability History Week poster. Register your school here and receive a poster from last year. Links to online Disability History Videos. [Name of Organization] is proud to be honoring and celebrating Disability History Week (DHW). The second week of October is Disability History Week in California, as passed by the legislature in 2010. Disability History Week is about educating youth with and without disabilities on the many contributions people with disabilities have made throughout American History. Throughout the week of October 8 – 12, organizations and schools across California will engage in a wide variety of activities to celebrate and honor the disability rights movement. Our organization will be [activity/event] to demonstrate our commitment to Disability History Week. To learn more about Disability History Week go to, [organizations website]. How are you planning to implement Disability History Week? 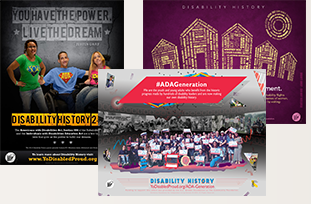 Held annually on the second week of October, Disability History Week aims to engage schools in educating students with and without disabilities about leaders and historic moments in the Disability Rights Movement. 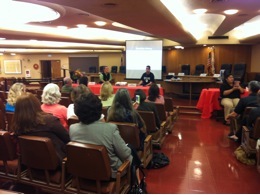 California’s Disability History Week was established by the California legislature and Youth Organizing (YO!) Disabled & Proud members in 2010. Learn more at, http://www.yodisabledproud.org/organize/disability-history.php. Positive change has come out of the work of the Disability Rights Movement and many times those changes have impacted everyone in society. Did you know that [disability history fact] was made possible because of the disability community? Resources for Educators & Organizers View Page Resources for teaching Disability History lesson plans, videos, resources and more. Disability History Week Fact Sheet Download DOC This fact sheet is a great resource in outlining some of the key bullet points about Disability History Week. 2011 DHW Campaign Plan Download PDF Every action takes planning, and the DHW Campaign Plan is the best way to get started. This plan covers an outline for timeline, resources, topics and more. Disability History Week in Schools Video Watch Video This video was created by youth with disabilities that attended a Northern California Disability History Summit. Hear in their words why they think disability history should be taught in schools. Collective Video Watch Video This video was created by The Disabled Young People's Collective (DYP). Use this video to embed on your website or organization's website. (Captioned) Watch Video This video was put together to celebrate the 35th Anniversary of IDEA (Captioned). (Captioned & Audio Description) Watch Video This video was put together to celebrate the 35th Anniversary of IDEA (Captioned & Audio Description). My Country Video Documentaries Visit Website Symphony conductor James DePreist, who contracted polio as a young man, profiles three people with disabilities whose lives have been shaped by the struggle for equal rights. He draws parallels between racial barriers and the barriers faced by people with disabilities. The Power of 504 Watch Video This is Award-winning 18-minute documentary video, which captures the drama and emotions of the historic civil rights demonstration of people with disabilities in 1977, resulting in the signing of the 504 Regulations, the first Federal Civil Rights Law protecting people with disabilities. This includes contemporary news footage and news interviews with participants and demonstration leaders. Available in open caption, audio descriptive and standard format. Disabled Young Peoples Collective Video Watch Video This video was created by The Disabled Young People's Collective (DYP). Use this video to embed on your website or organization's website. ADA Signing Ceremony Watch Video This video documents the speech given by President George H. W. Bush when he signed the Americans with Disabilities Act (ADA) into law on July 26, 1990. In the video, President Bush speaks to a huge audience of activists, Congressional supporters, people with disabilities, and their families and friends gathered on the south lawn of the White House. Free Our Voice Visit Website Videos From grass roots to grass tops, 1000 videos of people with disabilities from across America. Disability Culture Rap Watch Video Enjoy this historical, yet stylistic, video interpretation of disability history and it's culture. into Action Watch Video Learn about the FAIR Education Act, and how you can work with local school districts to help determine what and how disability history is taught the schools in your community. Vermont's Promoting Respect and Inclusion through Disability Studies Education (PRIDE). A curriculum for grades K-4 offering a new perspective in Disability Studies. Vermont's Promoting Respect and Inclusion through Disability Studies Education (PRIDE). A curriculum for grades 5-8 offering a new perspective in Disability Studies. Vermont's Promoting Respect and Inclusion through Disability Studies Education (PRIDE). A curriculum for high school students offering a new perspective in Disability Studies. Disability Rights Movement Visit Website This exhibit physically existed in the gallery from July 2000 to July 2001. Now it is only available on the web. This Web site represents what a visitor to the museum would encounter when using one of the kiosks in the physical exhibition. Zunal.com - Disability History Week Visit Website A Disability History Week Lesson Plan for grades 3-5. Leadership in the History of the Developmental Disabilities Movement Visit Website This web site is using MediaWiki, the same software package that powers Wikipedia, to create a deep, easily navigable repository of information about Disability History to complement the rich multimedia presentations that are the backbone of the site. History of the Individuals with Disabilities Education Act (IDEA) Visit Website Across the United States, nearly 6.6 million students with disabilities and their families rely on this law to ensure that they enjoy the same educational rights as all children. The initial law, Education for All Handicapped Children Act (Public Law 94-142), was signed into law on November 29, 1975, by then-President Gerald Ford. The IDEA guarantees access to a free, appropriate, public education in the least restrictive environment to every child with a disability. Learn more about IDEA by downloading Thirty-five Years of Progress in Educating Children With Disabilities Through IDEA in PDF or Word format. Disability History Guide and Timeline Visit Website This guide is designed to assist youth with and without disabilities to learn about the rich history of people with disabilities. Although designed primarily for youth and emerging leaders with disabilities, the guide can be used in multiple ways to educate a broader audience as well. Starting shortly before the United States was founded, the guide features examples of the remarkable diversity, creativity, and leadership that have shaped the disability community and American culture. Included is an interactive activity for use with groups to demonstrate societal and statutory events that have contributed to and continue to contribute to the true integration of people with disabilities in society. This guide is a new resource for the growing national movement to have disability history taught in the public schools and community-based organizations. Disability in American Life Visit Website The Missouri History Museum has launched a website which offers in-depth information on the early years of the Disability Rights Movement and the Independent Living Movement, passage of the ADA, life after the ADA, and the continuing battle to raise awareness and overcome barriers. The site also offers activities for children, parents, and educators. A Resource Guide for Missouri Download PDF This resource guide was developed to help Missouri school districts promote Disability History and Awareness Week. The guide contains promotional ideas, activities, and resources designed to expand students’ knowledge, understanding, and awareness of individuals with disabilities and disability rights history. Disability History Museum Visit Website This website hosts materials that are designed to integrate topics in disability history with larger themes addressed in secondary and higher education course work in U.S. History, American Studies, Civics, Government, and Law. Lessons are designed to stand alone, but they are also organized into themed clusters with each lesson approaching the main topic from a different perspective. Equal Treatment Equal Access Visit Website Anti-Defamation League Anti-bias Lesson Plans and Resources for K-12, this curriculum is focused on raising awareness about people with disabilities and their struggle for equal rights. Disability & Gender Equity Visit Website This web experience was designed specifically for high school students. You can choose one of the four topics on the left. The course shows you interesting facts and ideas about sciences and humanities that look at men and women and disability. Museum of disAbility History Visit Website This is a website designed for teachers to find various resources for your classroom including lesson plans, glossaries, activities, and educational information related to Disability History. The Disability History Project Visit Website Beyond Affliction: The Disability History Project is a four hour documentary radio series about the shared experience of people with disabilities and their families since the beginning of the 19th century. Disability Studies for Teachers Visit Website The ADL Curriculum Connections website also offers anti-bias lesson plans and resources for K-12 educators. History Through Deaf Eyes Visit Website The "DEAF EYES" project at Gallaudet University was established to bring Deaf history to the public and expand our understanding of United States history. The project is multi-faceted and includes an Exhibition: "History Through Deaf Eyes", a Documentary Film: "Through Deaf Eyes", a Book - Through Deaf Eyes: "A Photographic History of an American Community", a Poster Series and a DVD: "By Necessity and By Choice: How We Communicate". The History of Helen Keller Visit Website Helen Keller worked for the American Foundation for the Blind for more than 40 years. She was born on June 27, 1880. Deaf and blind from infancy, Keller played a leading role in most of the significant political, social, and cultural movements of the 20th century. Throughout her lifetime (1880-1968) she worked unceasingly to improve the lives of people with disabilities. Victims of The Nazi Era Visit Website Brochure published by the Holocaust Memorial Museum describing the Nazi treatment of people with disabilities from 1933-1945. Between 200,000 and 250,000 people with mental and physical disabilities were murdered under the code name Operation T4. History of Blindness Visit Website The American Action Fund for Blind Children and Adults, Summary of the History of the Education and Rehabilitation of the Blind. with Disabilities Act Visit Website Lex Frieden talks with John Wodatch, both men were integral in the development of the Americans with Disabilities Act and in this recording, they talk about how it came about and others that were involved in the fight against disability discrimination. A Look Back at "Section 504" Visit Website A Look Back at Section 504, San Francisco Sit-In a Defining Moment in Disability Rights History. Disability in American Life Visit Website A website that advocates action for access and changing perceptions of disability in American life. Disability in America Visit Website People with disabilities have been present throughout American history. Many stories and events related to people with disabilities never make it into the history books or shared public memories. Familiar concepts and events such as citizenship, work, and wars become more complicated, challenge our assumptions about what counts as history, and transform our connection with each other when viewed from the historical perspective of people with disabilities, America's largest minority. A Turning Point In Disability Rights Visit Website Terri Lee Halderman was a resident with minor disabilities at Pennhurst State School and Hospital in Spring City, Pennsylvania. In 1974, she filed a case against Pennhurst with a complaint that the conditions were unsanitary, inhumane, and dangerous. Independent Living MovementVisit Website A collection of more than 100 oral histories with leaders and shapers of the disability rights and independent living movement from the 1960s onward and an extensive archive of personal papers of activists and records of key organizations. Disability Simulation Articles Download PDF The following articles are from Ragged Edge Online (www.raggededgemagazine.com). America's Heritage Download PDF Disability History Brief developed by the US Department of Labor, Office of Disability Employment Policy. Online Disability History Exhibit Visit Website You can use this online Disability History Exhibit to educate others or use as a guide for creating your own exhibit. Available as PDF or HTML web pages. People with Disabilities Visit Website Concerns the history of the disability movement, legislative and judicial issues, and the importance of research for people with disabilities. Concentrates on the early days of the disability movement and the birth of the Americans with Disabilities. Independent Living Movement Leader Visit Website A brief history of Ed Roberts' leadership and contributions to the Disability Rights Movement. Disability History Week Petition Download DOC Begin your canvasing and petition drive with a petition sheet already created. Local Community Action Plan Sheet Download DOC Use this sheet as a tool to get started on your Disability History Week campaign. A Roadmap for States & Territories Download PDF One effective strategy for advancing the rights of people with disabilities is to establish a Disability History Awareness Initiative at the state or territory level. By passing legislation celebrating disability history, state legislatures can help their citizens learn from the successes of past and present disability activists who have worked to make our country more inclusive. Disability History Week in Schools Video Visit Website This video was created by youth with disabilities that attended a Northern California Disability History Summit. Hear in their words why they think disability history should be taught in schools. DHW Legistlation (Bill ACR 162) Download PDF This measure would designate the 2nd week of October 2010, and annually thereafter, as Disability History Week, and would encourage public and private institutions of higher education, state and local agencies, nonprofit and community-based organizations, and private businesses and corporations to observe Disability History Week by dedicating appropriate classroom instructional time or by coordinating all-inclusive activities to be conducted during that week to afford opportunities for students and the general public to learn more about the disability community and to celebrate and honor its role in contemporary American society. Across the Country Visit Website A website tracking important steps in the promotion of further understanding and awareness of disability history and the disability rights movement by designating a week to acknowledge the role and contributions of individuals with disabilities in our society.